Lattimer Gallery regularly works with customers to facilitate commissions. While we always carry a great selection of fine art in our gallery, people often order special pieces to meet particular needs and spaces. 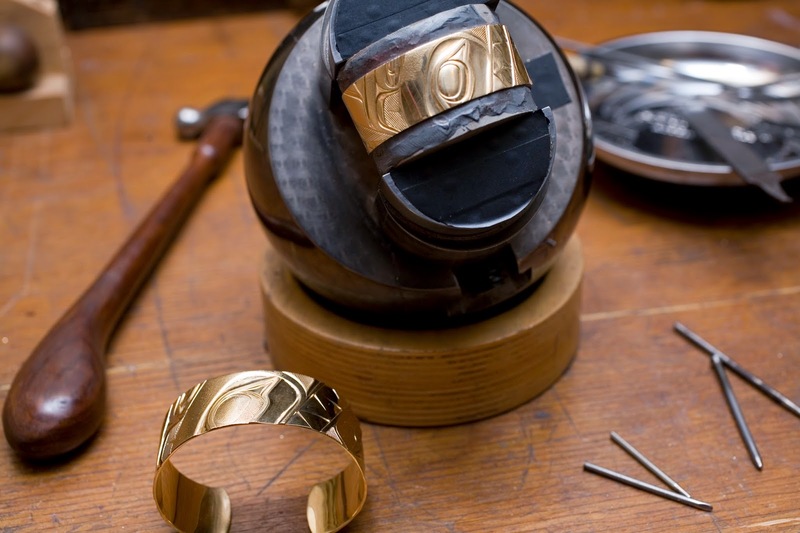 A good client of ours commissioned young Kwakwaka’wakw artist Clinton Work to design and engrave a matching set of solid 22k gold cuff bracelets this spring. Titled Eternal Love, this bracelet design depicts two interlocking wolves, a ghost figure to represent ancestors and love lost, and a human figure to represent future generations and familial bonds. Similar to most of his work, Clint has cropped all of these elements to provide each cuff with a contemporary design. This cropping also draws the eye in, as these are not typical Northwest Coast crest figures. After these pieces were shaped and carved in the round, Clint then hand-stippled all of the flat surfaces, a time-consuming finishing technique that provided the cuffs with a truly sculptural look. 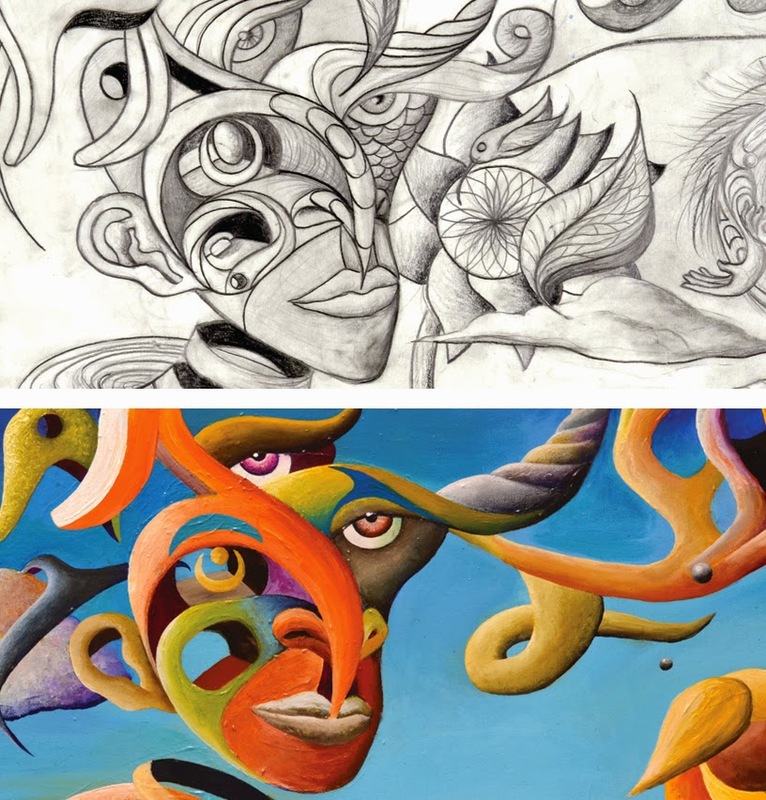 Lattimer Gallery featured the work of talented Coast Salish artist Cody Lecoy in our Fall 2013 newsletter, and since that time Cody has developed his style and received a YVR Art Foundation Scholarship. This March, we commissioned a painting from Cody, which enabled him to work through the process of completing a custom order. From the initial study in graphite to the finished painting, Cody updated us on his creative process through the entire project. The result - a colourful and surreal 24” x 48” painting titled Resurgence - was fantastic, and this piece is currently available for $1,200.00 CAD. The image below is just a small detail from this large composition. Lattimer Gallery frequently facilitates commissions, and we encourage our clients to contact us for any custom projects they have in mind.